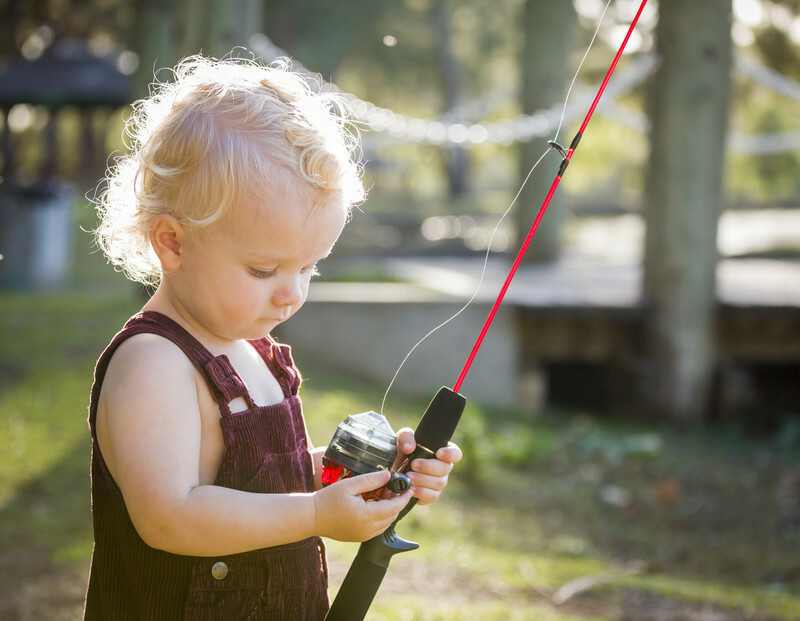 There are various fishing reels that have stood the test of time, and I offer ideas for family fishing gear that you should consider. This page is about family fishing and fun. 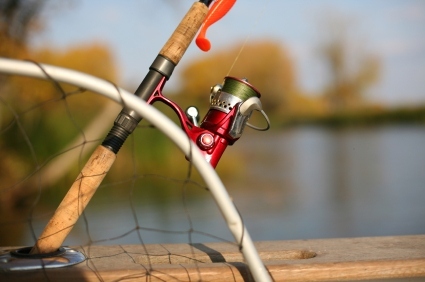 Fishing reels do go hand-in-hand with fishing rods and I'm going to give you some pointers and tips when it comes to purchasing them for the family. Most say that fishing isn't rocket science but you won't catch that keeper if you do not know how to work a reel. Let me explain. Whatever type you purchase, go out into your yard and put a weight on the end (what you would be using when fishing) and cast away. Just like fishing rods, there are thousands of different reels out there to buy and the freshwater reels are usually divided into four categories. They are bait-casting reel (left), fly-casting reel, spinning reel (and spin-casting) and the trolling (and center-pin) reel. The easiest reel to use is the spin-casting reel (left), and that's what everyone was taught on years ago. It is a mixture of the spinning and bait-casting reels. To describe, it is a fixed spool that is attached parallel on top of your rod and has a cone shaped device that your line runs through. It's like a spinning reel with a "cover" over it. Spin-casting reels are usually sold as "combos" along with the fishing rod and are a very popular set up. The spinning mechanism is under the cone shaped device so you are less likely to get snagged up. Spin-casting reels look primitive and like a winch, it uses a free spool instead of a fixed spool. This means that the crank can be disengaged from the cylinder when you cast, which leaves the cylinder to spin with little drag. Today, kids learn on the spinning reel right away and that is wonderful. 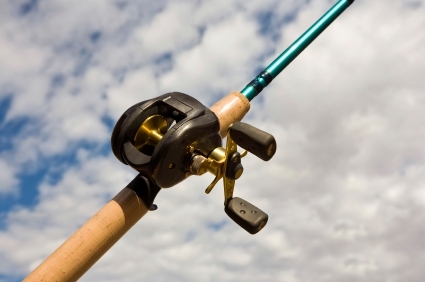 Most rod and reel combinations sold are spin-casting reels. Good beginner rods and closed reel combos for the smaller and younger children is the Shakespeare Ugly Stick . They are almost impossible to break and will last a long time. 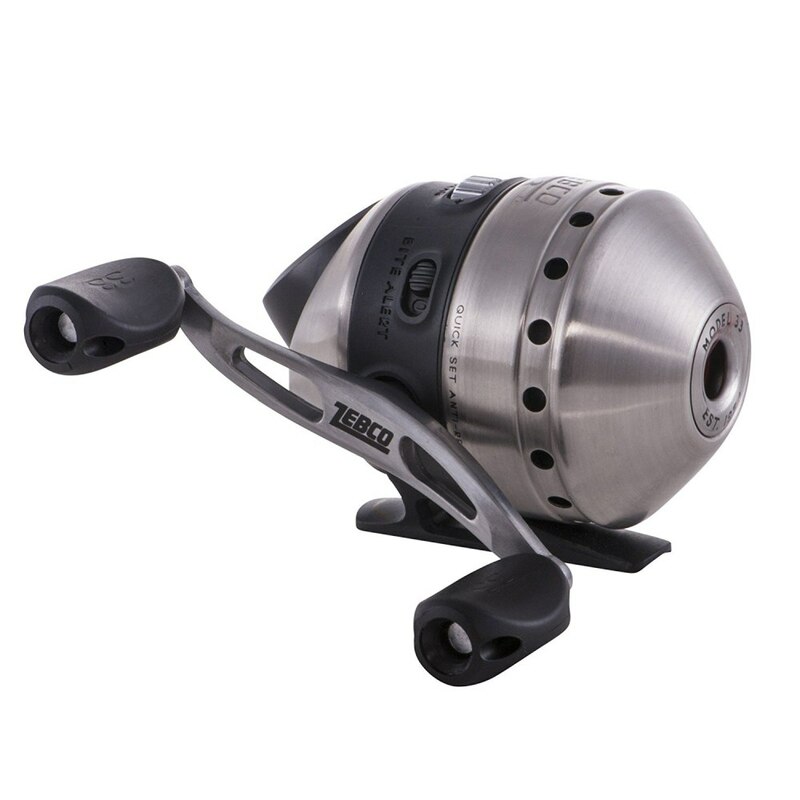 The Zebco Hawg fishing reel has a "bite alert" reel system that has an audible alarm when a fish strikes or is taking the line under. It also has a light that blinks, so it is a lot of fun to use at night. The spinning reel has the same advantages as the spin-casting reel. It also relies on a fixed spool that is open instead of covered. There are many advantages to this. You know when you will be running out of line, you can use a variety of lures and line combinations and it is more accurate when casting. The spinning reel is attached under the rod and the spool is fixed as shown in the photograph below. At the sporting goods store, it's hard to find a good variety of these. You are better off going to Target, Wal-Mart or K-Mart. The spinning reel is mounted under the rod and the crank for the line is on the left side. Many of these fishing reels have anti-reverse switches so the handle doesn't turn when you don't want it to. Learning to cast with a spinning reel takes some time but once you get it, it offers a lot more control. On the negative side, the fishing line has a tendency to get tangled up. A bait-casting reel come with a line release guide so the line doesn't get tangled. This reel is attached to the top of the rod and the crank is on the right. If your having problems setting the drag and brake (which are pretty straight forward), refer to the directions and follow them exactly. (Many men don't and WON'T do this anyway...) Educating the thumb is the hard part, but thousands have learned it, so you sure can too. The difference between a spinning reel and a bait-casting reel? CONTROL. You will have it from the beginning of the cast until you hook your fish. Lure presentation is much easier and because you have control of your cast you can make a soft presentation. With a spinning reel the lure just "drops" into the water, unless you pull back on the line when casting. With the bait-casting reel, you can control the fall and gently set your bait down on the surface of the water without making noise. When they designed this reel it has so much more strength and can reel in BIG fish. The negative side is learning how to use it. It takes a lot practice but once you get the hang of it, many say that you will never go back to the open faced (spinning) fishing reels again. 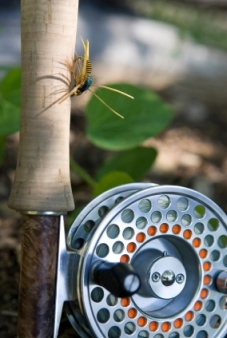 A fly fishing reel is based on an entirely different concept of casting. Instead of relying on the weight of the lure and sinker, casting with this reel - you use light lures of feathers and fur and the line isn't pulled along after it. The reel is designed to hold heavy and thick fishing line and it is mounted below the rod on a foot and the crank handle is on the right. It takes a LOT of practice to successfully cast using this reel, but it is very popular fishing for any species of fish presenting the lure on top of the water. Just remember this; fly fishing also requires the weight to also match with the rod, line, reel and lures. The spool is the part of the reel that holds the fishing line and is detachable. Usually they are make of graphite or aluminum; graphite spools are lighter than aluminum reels. Aluminum reels do cost more, but the belief is that they are more durable, but either reel will resist erosion from the water. The frame is used to give the reel its shape and are made of graphite or aluminum. Line capacity is key when you are determining which reel to purchase because some only hold 15 yards and others can hold 850+ yards. The amount of line that you will need depends on where you fish. If you go to your local lakes and ponds, you do not need a larger reel with more line capacity. If you are fishing the great lakes, that's a different story and you will need more line. Gear ratios tell you how quickly a reel will retrieve the fishing line for each revolution on the crank. Generally, lower ratios provide more power to haul in the fish from deeper depths. Higher gear ratios are great for pulling fish that are closer to the surface of the water. Ball bearings help support the moving parts of the reel; the higher the number, the smoother the reel will work under pressure. Of course the price for the fishing reel is higher for more ball bearings. 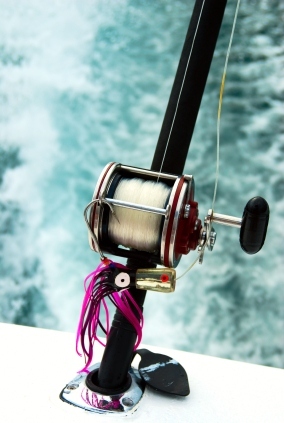 A trolling reel is popular among some anglers. You want to find one with adjustable casting control that will allow you to maximize the casting distance. The trolling fishing reels will have a "star drag" or "lever drag" system. Star drag describes pressure that is increased or decreased by a star-shaped wheel. Lever drag is usually considered the better of the two because you will have more precise adjustments and gives you more options. You can see exactly where the drag is set by looking at it. You cannot with the star drag. Before you go out fishing you can preset your drag at the dock and again you cannot with the star drag. Lever drag also offers more control when trying to land a big fish. Trolling rods vary according to what you are looking for.